According to the Navajo creation myth, First Man and First Woman created the four sacred mountains surrounding Dinétah, the Navajo homeland. One of these mountains is Tsoodzil, or Turquoise Mountain (what is known today as Mount Taylor), located just northeast of present day Grants, New Mexico. After First Man and First Woman formed this mountain, whose symbolic color is blue, various creatures and plants, such as blue birds and blue corn, were sent to live in it. Spiritual beings in human form, such as Turquoise Boy and Girl, were also sent to reside in the mountain. Turquoise Girl, the daughter of Changing Woman, is associated with guarding the mountain's turquoise as well as with the cultivation of corn. In some songs and legends she may appear as White Shell Girl, and the two figures are often used interchangeably. 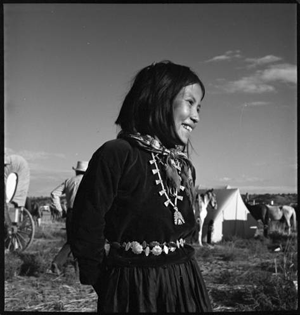 "Young Navajo girl near Gallup, New Mexico, circa 1941," photograph by John Candelario, (180433). Palace of the Governors Photo Archive, New Mexico History Museum, Santa Fe, New Mexico. 2013 Mount Taylor (Tsoozil) Navajo Sacred Mountain. Navajo People Culture and History. http://navajopeople.org/blog/mount-taylor-tsoozil-navajo-sacred-mountain/, accessed November 25, 2014. 1983 Handbook of North American Indians: Southwest. Washington: Smithsonian Institute. 1970 Blessingway. Tucson, AZ: The University of Arizona Press.